1700 pages; 7¾" x 9¼"
The Broadview Anthology of British Literature presents British literature in a truly distinctive light. Fully grounded in sound literary and historical scholarship, the anthology features an extraordinarily wide-ranging canon, with close attention paid throughout to issues such as race, gender, class, and sexual orientation. It offers a fuller range of contextual materials than any competing anthology, including extensive illustrations throughout each volume. The introductions to authors and periods are superb and comprehensive, and annotations provide the information students need without interfering with their interpretation of the text. Innovative, authoritative, and comprehensive, The Broadview Anthology of British Literature has established itself as a leader in the field. In addition to the full six-volume anthology, the Broadview Anthology is available in two condensed forms: a two-volume Concise edition (about 3600 pages total) and a single-volume Compact version (2100 pages). All versions of the anthology are accompanied by an extensive website component that includes hundreds of additional readings and other interactive material. The website content has been edited, annotated, and designed according to the same high standards as the bound book component of the anthology, and can be accessed using the passcode obtained with the purchase of one or more of the bound volumes. — New short selections from longer works including Eliot’s Middlemarch, Shelley’s Frankenstein, Barrett Browning’s Aurora Leigh, and Tennyson’s In Memoriam A.H.H. Note: asterisks appear below to indicate material that is new to this volume or is appearing in the bound book portion of the volume for the first time. from Ann Radcliffe, “On the Supernatural in Poetry”. Chapter 8: Can Writing Be Taught? — Companion website includes complete texts of Byron’s Manfred, Blake’s Songs of Innocence and of Experience, and Tennyson’s In Memoriam A.H.H. 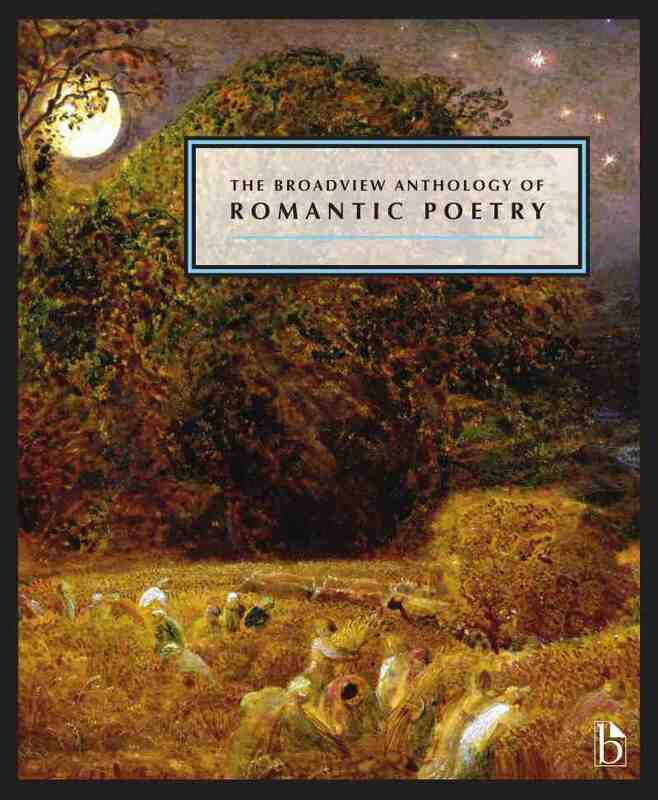 The Broadview Anthology of British Literature companion sites include content for both instructors and students. The Online Resources Site for both students and instructors features close to 200 interactive review questions; over 500 online readings across all volumes of the anthology, with 128 additional readings specific to this volume; details on British currency; chronological charts; bibliographies; an audio library with 37 samples ranging from Old English to the early 20th Century; and more. An access code to the website is included with all new copies. If you purchased a used copy or are missing your passcode for this site, please click here to purchase a code online. A separate instructor site features background material, over 200 discussion questions, and “Approaches to Teaching” for key works and authors in the anthology; it also offers a list of anthology contents by theme and region. An access code to the website is included with all examination copies. Add any edition to a package containing one or more BABL volumes for FREE! A second edition may be added for only $10. To view a complete list of available editions, please click here. Please note that packages containing four or more volumes may need to be split up due to their bulk. Please contact your Broadview Rep or customerservice@broadviewpress.com for a package ISBN. Broadview is happy to create a custom coursepack including only your selected readings, from this and/or any of our other anthologies and editions (with the exception of readings that are controlled by a rights holder other than Broadview Press). We offer an easy and intuitive Custom Text Builder, and you can also contact our Custom Text Administrator. If you would like to inquire about different package possibilities, please contact customerservice@broadviewpress.com or your local sales representative to be sure of obtaining the most advantageous pricing option for your students. Further discounts may be available for large course adoptions.